Racing thoughts are associated with several psychological conditions, particularly generalized anxiety disorder and bipolar disorder. Although these conditions often are treated with prescription medications, vitamin deficiencies can either cause or exacerbate anxiety and bipolar disorders. In particular, a lack of B vitamins, especially B-12, can cause racing thoughts and other symptoms of anxiety and bipolar disorders. Although the evidence is not as strong, a lack of vitamin C also might cause anxiety symptoms. And while omega-3 fatty acids are not technically a vitamin, a deficiency in omega-3 is associated with anxiety and depression and can be treated with supplements or foods high in omega-3. If you have generalized anxiety disorder, MayoClinic.com recommends avoiding excess amounts of sugar and processed foods. It advises you to include foods rich in B vitamins and omega-3 fatty acids in your diet. Foods rich in vitamin B include meats, fish, lamb, cheese and eggs. High amounts of omega-3 fatty acid foods include salmon and flax seed. Supplements of B vitamins and omega-3 oil can augment your diet. A deficiency of vitamin B-12, in particular, is associated with anxiety and depression. According to the National Institutes of Health, B-12 deficiency can lead to anxiety, stress, irritability and mental confusion. The elderly, who have more trouble absorbing adequate levels of B-12, those with certain stomach conditions, and vegetarians, who might not get adequate levels of B-12 in their diets, are particularly susceptible to vitamin B-12 deficiency induced anxiety and depression. If a B-12 vitamin deficiency is not remedied, it can lead to permanent cognitive impairment. According to the Sound-Mind website, vitamin C can lower cortisol levels and keep your blood pressure down. High cortisol levels are associated with anxiety, so foods rich in vitamin C or supplements might help with anxiety symptoms. However, the scientific evidence linking vitamin C deficiency with racing thoughts and other anxiety symptoms is not as well established as the connection between anxiety symptoms and vitamin B-12. Anyone who has experienced racing thoughts and other symptoms of anxiety or bipolar illness know how debilitating they can be. If you can't control racing thoughts, see your doctor or a mental health professional. You might be tested for vitamin B-12 deficiency. If you are deficient in B-12, injections can remedy the problem. 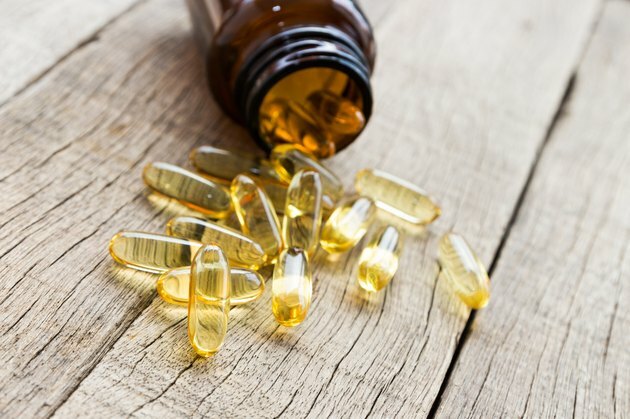 Oral supplements are not as well absorbed, although some studies indicate that most people who take oral supplements can absorb them well enough to restore you B-12 level to adequate levels. Sound-Mind: The Anxiety Diet -- What Should You Be Eating? Can a Panic Attack Be Caused by Vitamin B12 Deficiency?